My name is William M. Windsor. I have never been arrested, have never been charged with a crime, and had never been in jail prior to October 28, 2014. But for 53 days, from October 28 to December 19, 2014, I was detained in the Ellis County Jail in Waxahachie, Texas as a political prisoner. This is Part 4 of my story. 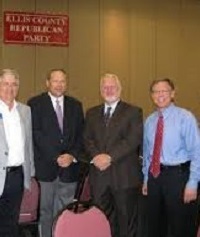 Judge Bob Carroll of Ellis County Texas is pictured here (far right) with some of his Republican buddies. Judge Bob Carroll is a central figure in the corruption against me (and undoubtedly others) in Ellis County Texas. What I am publishing is a sworn affidavit that I filed on December 11, 2014 in criminal cause number 14-158 in the 40th Judicial District Court in Ellis County, Texas, Ex Parte William M. Windsor. I will be linking evidence to these articles as time permits. If you haven't read Part 1, Part 2, or Part 3, please do, as this makes the most sense when read in chronological order. In the following sworn statements under penalty of perjury, I refer to myself as the “Relator,” which I understand is the proper designation in a habeas corpus proceeding. 45. The Relator continued to regularly ask the jail to accept his bond. Requests were ignored or denied with no legal basis for denial ever given. 46. The Relator continued to request an audience with an Ellis County judge to present his Petition for Writ of Habeas Corpus. His requests were ignored until 3:30 pm on November 25, 2014 when he was taken before Judge [Cindy] Ermatinger. Judge [Cindy] Ermatinger accepted a copy of the Relator’s Petition for Writ of Habeas Corpus, but she said she did not have jurisdiction to consider it. The Relator asked which court did, and the Judge said “Montana.” The Relator explained that neither Texas nor Montana law provide for that. The Relator cited Drake v. Spriggs and TCCrP Article 51, but Judge [Cindy] Ermatinger did not budge on her position that she had no jurisdiction. She was wrong. 48. The evening of November 26, 2014, the Relator received an Inmate Request Form back from [Ellis County Texas Sheriff's Department] Lieutenant Goggans in response to a request. The Relator had asked the Sheriff’s Department to identify any statute that gave them the right to refuse the Relator’s Texas bond and have Montana dictating what is done here. Lieutenant Goggans wrote that Article 51 provides the authority. It does not. 49. On November 27, 2014, the Relator demanded his release after 30 days in the Ellis County Jail pursuant to TCCrP Article 51 section 15. Exhibit E hereto is a true and correct copy of the attachment to an Inmate Request Form that the Relator sent to Booking and the Respondent. Montana did not appear in 30 days as required by law. The Relator was not released. 50. The Relator did not commit any crimes in Montana or Texas. 51. The Relator was denied any further legal research at 5:00 pm on December 2, 2014. 52. At 6:00 pm on December 2, 2014, the Relator received a hand delivery of a Memorandum Ruling by Judge Bob Carroll dismissing the case in 88611 against Sean D. Fleming. The Relator now knew that Judge Bob Carroll was absolutely corrupt. Sean D. Fleming had published outrageous defamatory statements. I will add more detail and exhibits to Part 4, but I want to get the basic story out there first. Then I'll go back and supplement. I have diary information to add as well. It was during this period that I first saw the inhuman tretment of prisoners at the Ellis County Jail. Part 1 is the background to the story. Part 2 discusses when Bill Windsor was handcuffed and taken to jail from a hearing in a civil suit that he filed against the people who have viciously defamed him in what is the largest case of defamation in U.S. history. Part 3 details early days in jail and attempts to get someone/anyone to help; the conspiracy to keep William M. Windsor in jail begins to come to light. Part 4 covers events from November 26, 2014 through December 2, 2014 as the corruption of Judge Bob Carroll erupts in full bloom. Part 5 introduces Ellis County Texas District Attorney Patrick Wilson into the corruption picture. Part 6 leads to a December 19, 2014 at which Bill Windsor was ordered released by Judge Cindy Ermatinger.